After six years of research in Toyota factories and testing hypotheses, Mike Rother describes how Toyota manages their people. Toyota Kata is an excellent book, which really adds something new to the existing Lean literature, therefore I advise everyone to read it! The main message: Behavior routines, the so-called Improvement Kata and Coaching Kata, determine how everyone within Toyota strives iteratively to reach a Target Condition. This brings the company a step closer to a Vision, but along a route that is a priori unclear and full of hidden obstacles. This is something completely different then our management by quantitative and financial targets, in which not only what but also how things should be done is determined beforehand. This results in ‘projects’ or ‘action-lists’, which often often fail due to unforeseen barriers. This organizational difference explains why many Western companies until now often could become Lean, but failed to stay that way. Toyota turns out to be an organization in which everyone is a problem-solver, guided by a coach! Can we learn to climb a mountain in the fog like Toyota does, and eventually perhaps even become better than they are in developing new Lean tools? What many companies learned during the last twenty years, is that it is much more difficult to stay Lean then to get Lean. Often, after a few successful improvement ‘projects’, old habits and wasteful processes returned. Why is it so difficult to create a business culture in which all people, everywhere, help to improve every day? What did these companies do wrong? According to Mike Rother, the author of Toyota Kata, the answer is: Those companies only copied the superficial part of Lean: tools like value stream mapping, 5S and Kanban. What they didn’t do was change their management approach to support Lean behavior. In a way, you could say that Western companies pushed the idea of management by objectives, as formulated by Peter Drucker, too far. Originally, Drucker left room for a dialogue between managers and their subordinates about what should be done, but nowadays managers only seem to be setting quantitative targets in a distant office, and are assessing reports of metrics. That way, we suffocated the capability and creativeness of our employees to solve problems locally. Western management is still dominated by the once very successful approach of General Motors, focused on making money and with decisions driven by return-on-investment analysis. In such a controlling environment there is little space to learn from experiments. No wonder that we have no culture of continuous improvement in our companies! Striving towards a distant business goal resembles climbing a mountain in darkness with only a small flashlight, so you can only see a small part of the route to be explored and traversed. Planning and then executing big improvement steps (read: projects) therefore makes little sense, since there is a big risk that these projects will which fail due to a – yet invisible - big rock lying on the way. According to Toyota, it is better to make many small (but quick) steps of improvement, during which we climb and the next part of the route becomes more clear. Toyota developed behavior routines for their managers and team leaders about how they should climb a mountain in the dark. Rother calls these routines ‘Kata’ although - as he states in his book – inside Toyota these words are rarely used. The Improvement Kata and Coaching Kata describe how the people inside this company work. Kata, a Japanese word for ‘form’, refers to patterns of movements, for example in martial arts. 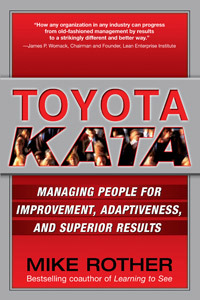 In the book, the word Kata is used to describe ways of dealing with dynamic and unpredictable circumstances on the route to improvement. There is an Improvement Kata (for the mountain climber) and a Coaching Kata (for a mentor who coaches his mentee and keeps him or her on the right track while climbing). Before you can use these Kata, you need to have a Vision as a direction-giver or true north: which mountain do you want to climb? A one-piece flow, in sequence, on demand, and this with zero defects, 100% value adding activities and with security for the people. Note that seen in that light, Lean tools like Kanban are only aids to find things that should be improved, since Toyota’s Vision contains no Kanban! Intriguingly, more or less the same vision – striving towards a continuous conveyor belt - was used by Ford in the first decades of the twentieth century. Problems however arose when the number of car types increased, and thus the number of value streams. At that moment, Ford’s original Vision was gradually abandoned in favor of the at the time very successful but also very controlling management method of General Motors, described earlier. Subtitle: Managing people for improvement, adaptiveness, and superior results. By: Mike Rother. Rother began his career in the manufacturing division of Thyssen AG. Today he is researcher, engineer, teacher and speaker on the subjects of leadership, adaptiveness, and change in human organizations. He has taught extensively at the University of Michigan and he is a guest researcher at the Technical University Dortmund. 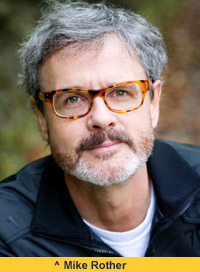 In addition, Rother is known for his co-authorship of the book Learning to See, which is about Value Stream Mapping. Supplemental information: Publisher McGraw-Hill (2010), 306 pages. o The book suggests that the true core of Lean is improving via a beforehand unknown path, by problem-solving under guidance. I think however, that the logistic solutions (the lean tools) developed during the last century are even important. - In the book, it is stated that applying the ‘Kata’ solves the problem of uncertainty on the route towards a long-term Vision. What is however left undiscussed is that the correctness of such a Vision is also uncertain! So, there is a risk that your company strives to fulfill the wrong Vision. In contrast to the author, I think that it is not ideal for every company to strive for a one piece flow in sequence, and if so, this ideal could change in the future. A Vision gives direction, but says nothing about how to improve. This vagueness is however good, since the improvement path is unclear territory anyway. Progress along this uncertain path is made by applying the Improvement Kata. Team leaders strive to reach a certain Target Condition, set in collaboration with their superiors. These superiors are often also their mentors, who apply the Coaching Kata, see further. A Target Condition is a challenge, an in weeks or months attainable intermediate stage on the route toward the Vision. Using the metaphor of a mountain again, a Target Condition is a plateau somewhere along the way. It is the work of a team leader to bring a process to its target condition, by taking small but quick steps, via cycles of plan-do-check-act (PDCA). Intriguingly those steps sometimes are a matter of trial and error (of course within safe process boundaries). Since you do not know what is ahead on the route climbing the mountain, you should learn along the way! What is the Target Condition (the challenge)? What obstacles are now preventing me to reach the Target Condition? What is my next step (what will be the start of the next PDCA cycle)? When - as soon as possible - can we go and see what we have learned from that step? Because many small steps are taken, progress may look slow. However, that doesn’t have to be the case when subsequent steps follow quickly, one after another. It is certainly possible to take more than one step during a day. When the Target Condition is fulfilled, a new Target Condition is set (you could see this as a flag on a new destination plateau on the mountain) and the whole process starts again. The Improvement Kata is a set of behavior guidelines for which a lot of discipline is needed. It is not learned in a classroom but by doing, through repeated practice. Therefore, everyone in Toyota is coached by a more experienced person, a mentor or a sensei. Teaching how to improve is done via a mentor/mentee dialogue, which Rother calls the Coaching Kata. This could well have its roots in the Buddhist master/apprentice teaching method. A mentor guides his or her mentee through the Improvement Kata, but this is not done by simply telling him or her what to do. The teaching process is much more subtle, it has only the aim to keep the mentee within the corridor of the Improvement Kata, by asking Socratic type of questions. This way the mentee is able to learn – again via guided trial-and-error! 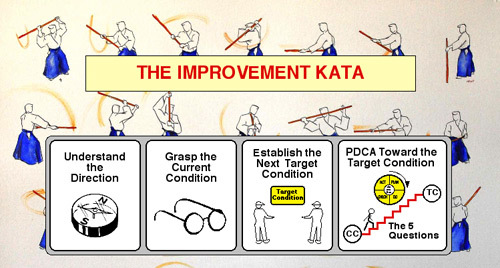 - the routine and way of thinking inherent in the Improvement Kata. During the dialogue between the mentor and the mentee a one page paper in A3 format, which is edited over and over again, can be used to visualize the steps of the Improvement Kata, and the information from the Gemba on which those steps are based. This structuring of the ongoing dialogue is the so-called A3 management process. Toyota Kata is an excellent and very well written book, that really adds something new to the existing Lean literature. It explains how Toyota deals with the people part of Lean, and therefore I advise everyone who applies lean manufacturing to read it. That said, I also want to give some comments. After reading this book, you might have the impression that behavioral routines – the Improvement Kata and the Coaching Kata – form the true core of Lean. In that case, Lean is all about focused problem-solving under guidance, in an explorative and scientific way. In my opinion, this idea is pushed too far. Let me explain. In the book, it is stated that a mentor is asking questions not to direct a mentee to a particular solution. However, if this is truly done that way, the mentee is withhold from more than hundred years of experience with Lean solutions and tools, starting with the famous moving assembly lanes of Henry Ford. In the book, a comparison is made with sports training. From my personal experience (I am an enthusiastic ice speed skater) I can tell that sports training is not done by asking Socratic questions, but by giving instructions. A skater is observed by a trainer, then receives suggestions to change something, and finally tries these adjustments out. The suggestions a trainer makes are based on state-of-the-art knowledge about speed skating, so why wouldn’t a Lean mentor do the same and feed his mentee with ideas? Another comment is that the application of the Improvement and Coaching Kata does not necessarily have to be combined with Lean manufacturing as improvement method. This is however not criticism. On the contrary, it only extends the applicability of the ideas described in the book. In my opinion, if your company uses for example Six Sigma, Total Productive Maintenance, Quick Response Manufacturing or the Theory of Constraints, nothing should restrain you from building a culture of continuous improvement by using the two Kata’s! "1x1 flow at lowest cost is a universal and century-old vision, to provide something when needed"
Thank you for reviewing Toyota Kata. It is great to see the widespread attention that the managerial practices presented in the book are getting. Your detailed review will undoubtedly help spread the ideas. Here in the U.S. many companies are beginning to use the improvement kata, and I was happy to learn that this week Toyota Kata received a 2011 Shingo Prize for Research and Professional Publication. As my colleagues and I apply the routine of the improvement kata and learn more about it, what fascinates me is how it makes creativity teachable. Everyone in an organization can participate in applying the improvement kata, since improvement, adaptation and innovation are made up of many small steps. This is a kind of respect for people -- for developing and using everyone’s capabilities -- that may be necessary in order for us to meet the challenges that face us. Many people express interest in Toyota’s coaching/mentoring approach, in particular the practice of asking questions of the learner. Unfortunately there is some misconception about Toyota mentors’ practice of asking questions. Yes, indeed, one reason they do that is so the learner will figure things out for him or herself, which is a well-known pedagogical, Socratic method. But that alone will not develop systematic improvement capability in an organization. There is another, less visible dynamic going on when a Toyota mentor asks questions The Toyota mentor is observing the learner and is asking questions to assess whether or not the learner is operating within the corridor of thinking and acting prescribed by the improvement kata. This is not so much the Socratic method. It is coaching for skill development like in sports, as you point out. The mentor is comparing the learner's pattern of thinking and action with the pattern of the improvement kata. And then the mentor, just like your skating coach, may well be directive about the next step, i.e., about what the learner should practice next. The word ‘kata’ really is quite appropriate here. My second comment is about the need for a longer-term vision, that provides direction for applying the improvement kata. In factory value streams we can say the vision is 1x1 flow at lowest cost, but, as you ask, when we go into other business sectors what should be their vision? Good question! I would like to propose that 1x1 flow at lowest cost is a universal vision for any business sector. Perhaps that is not even optional. It is part of a natural evolution, already going on for ages, to provide something when wanted and needed. Thank you again for your support of Toyota Kata, and for your efforts to help develop stronger lean leadership skills in all of us.